4 CM LONG 3 CM WIDE 2 CM HIGH. 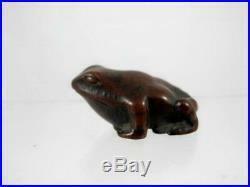 JAPANESE MEIJI PERIOD CARVED WOODEN FROG NETSUKE, C1890'S. ORIGINAL CONDITION & PATINA WITH NO DAMAGE. CAN BE VIEWED AT OUR SHOP, HUNTERS & COLLECTORS ANTIQUES, 8 BOWRAL RD MITTAGONG, NSW, AUSTRALIA. 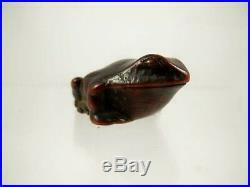 The item "JAPANESE MEIJI PERIOD WOODEN FROG NETSUKE C1890'S" is in sale since Thursday, December 7, 2017. 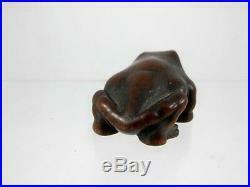 This item is in the category "Antiques\Asian Antiques\Other Asian". 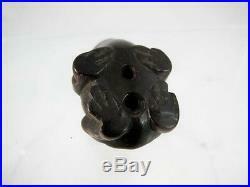 The seller is "huntersandcollectorsantiques" and is located in Mittagong, New South Wales. This item can be shipped worldwide.